+$Comics have never been more popular, so if you’ve got a hankering to break into the industry then this special issue of ImagineFX is a great place to kick off your career. 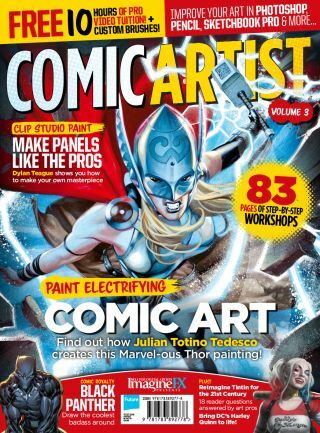 +$Among its 148 pages you’ll find workshops from pro artists such as Jean-Baptiste Monge, Brett Parson and Admira Wijaya, who paint iconic comic characters Hellboy, Tank Girl and Harley Quinn. There are also bite-sized tips on boosting your core comic art skills, and interview with Saga artist Fiona Staples and look back at how Conan’s appeared in the comics over the years. +$Comics art tips and tricks from our panel of pro artists, who explain how to use shadows menacingly, create a backlight around a character, body language and more. +$Conan has been a comic staple since 1952. We chart the rise, fall and rise again of the bolshy barbarian over the years, and speak to the artists who’ve drawn him in action. +$We talk to Fiona Staples, the artist behind the multi-award-winning comic Saga, and find out why she’s keen to support the indie publishers and the idea of creator-controlled titles. +$Discover how Nimit Malavia, an artist who’s worked with DC/Vertigo, Marvel and Dark Horse, took the classic design of Tintin and gave him a 21st century makeover in the Fables style. +$Don’t delay, buy this special issue today!